Bouncy Baby-sitter ~ Winnie the Pooh Collection ~ Handcrafted ~ Dated 1998 ~ QXD4096. 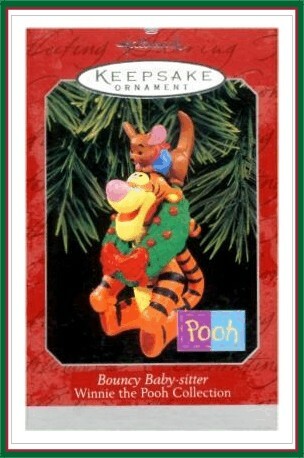 Such a cute ornament; Tigger has not only a wreath around his neck, but Roo is perched on top of the wreath. This is Tigger's idea of babysitting. Disney - Based on the "Winnie the Pooh" works.